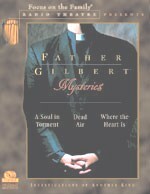 When Louis Gilbert turned in his detective’s badge to become a priest, he thought his days of solving difficult mysteries were over. Now, as the vicar of an ancient church in a small English village, Gilbert finds himself at the center of one strange mystery after another. And he brings to each one his unique combination of street-wise smarts and spiritual intuition. In A Soul in Torment (52 minutes), Father Gilbert hears a confession of murder from a young man. But no murder has been committed, and the young man appears to have been a dream. In Where the Heart Is (53 minutes), Father Gilbert is caught up in the search for a mysterious and valuable chalice. In Dead Air (77 minutes), Gilbert encounters a nemesis from the unsolved case that caused him to resign from Scotland Yard. You can expect plenty of twists and turns from the Peabody Award-winning Focus on the Family Radio Theatre—with film-quality sound design and music, and the talents of some of England’s finest actors. They’re the best audio dramas your ears will ever see! Due to themes of a mature nature, Dead Air is recommended for listeners ages 15 and up. Available in 3 CD set. "What if miracles and wonders are truly taking place there?" "Dont be silly, Father. Were 21st century Anglicans. We dont believe in such things." When a blind woman is suddenly made to see in Healing (72 minutes), it raises more than a few eyebrows around the small English village of Storwich. In fact, the faith-healing ministry that cured her (and a number of others) becomes the object of an intense investigation led by Father Louis Gilbert, the ex-Scotland Yard detective turned Anglicn priest. Are the miracles legitimate? Is the charismatic "Gabriel" really who he says he is? Finding out is going to take all of Father Gilberts skill as a priest and an investigator. And the answers are more dangerous than anyone imagines. A train crash. The strange kidnapping of Bill Drake, Father Gilberts best friend. Two unrelated events--but are they? In Secrets (73 minutes), the clues are scattered far and wide, over space and time, and putting them together seems impossible. The newly-captured kidnapper certainly isnt going to admit to anything. And Bill Drakes heart condition is like a ticking bomb--forcing Father Gilbert to choose between his ruthless instincts as a former detective and his calling as a compassionate priest. Time is running out." Available in 2 CD set. Take an Anglican minister with a background as a Scotland Yard detective. Then add some perplexing mysteries. What you get are original radio dramas that challenge your mind, inspire your soul, and keep you on the edge of your seat! It’s a case of life and death, but whose life and whose death can’t be known until the final minutes.